The Grundig GS350DL/Eton S350DL (a.k.a. Tecsun BCL-3000 outside N. America) is a large portable “field” radio with SW, FM and AM coverage. 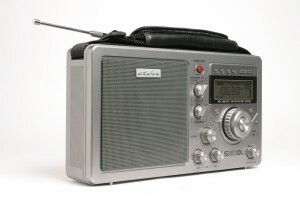 This radio has a digital display, but analog tuning, thus no way to store frequencies in memory. Two major pluses for this radio are its audio fidelity via built-in speaker and its simplicity of use. Shortwave – continuous coverage from 3 to 28 MHz. • This includes 13 international broadcast bands. This entry was posted in Grundig, Portables and tagged Eton, Eton S350DL, Grundig, Grundig GS350DL, Grundig GS350DL Reviews, Grundig S350DL, GS350DL, S350DL. Bookmark the permalink.